So, I found out my crawl space became flooded when my sump pump balloon switch failed. I have a meter switch (Aeon Labs Smart Energy Switch - DSC06) and it works really well for what I need it for..which is to always remain on and to report sump pump runs (power and energy runs). Needless to say I don't pay too close attention to the energy meter reports as I get busy but I noticed it didnt run for a month! 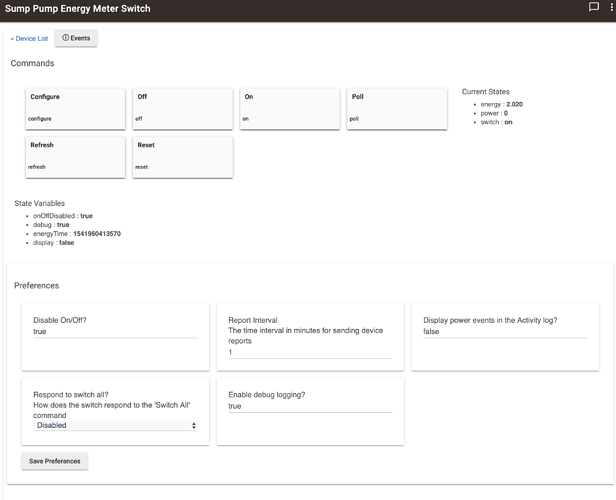 So I am looking for a way to to make a rule to monitor the energy switch and send an alert if no energy reports for say...4-5 days. You can see how often it reports on the last image above. Does anyone know how I can go about this? Thanks in advance! I did play around with that but I just cant get the logic down. I know I can trigger the alert for when it runs but I'd like to just monitor a period of time and alert if no energy is used during that period. Thoughts on how to do this? Yeah thinking about it a little further, it’s not enough to just monitor the energy usage, since that doesn’t tell you when there’s water that needs pumping. So it would be better to add one of those leak detectors that has a long lead on it, and add that to the condition. 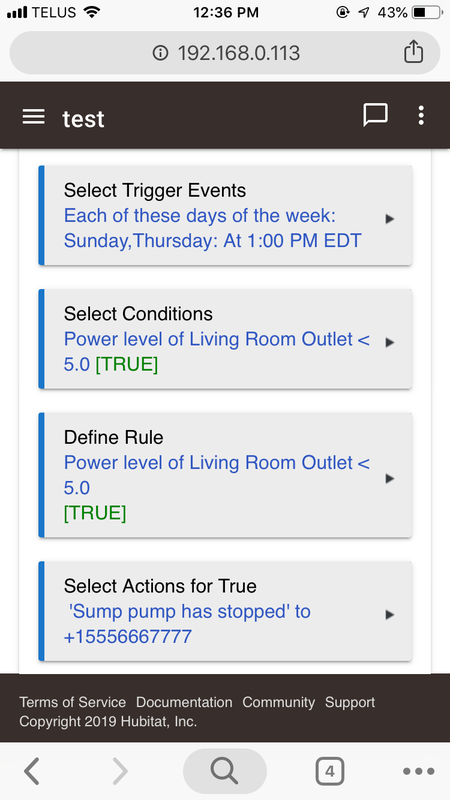 So something like leak sensor detects water and the sump pump energy usage is below a certain value, then the rule is true and you should be notified. Yes, water sensor was at the top of my mind but because the crawl space is vented to outside I'm afraid of freezing temps ruining a water sensor. Thanks for your help though! I was looking at this same "concept" for a rule for doing hub shutdowns when power is lost, as my hub is connected to a UPS, and the UPS is connected to a zwave power monitoring outlet. It’s just two contact on the end of a cable. They wouldn’t be damaged by freezing but the device should be converted to use mains power, because the freezing temps would kill the batteries quickly. However, if you have the sump pump exposed to freezing temps, the pump and or it’s float switch could be damaged, so then you’ve got more problems to contend with. For that I plan to implement this from @srwhite when I have time. Both of mine are CyberPower brands not APC, I don't have a Raspberry Pi, or a NAS (yet).....I tend to agree with @vjv on that post.....to stay away from Difficulty Hard tasks especially with my experience level. Yes, I think that is what happened when we had freezing weather...the floating switch got stuck off. I will investigate a main powered water sensor. Do let me know if you have any recommendations. Not liking the Utilitech that I currently have behind the washing machine. The Aeotec 6 leak sensor has a dock option so you can power it with a 5v micro USB supply, and then the device battery becomes a power backup. You can add these ropes to detect leaks in large areas or on uneven surfaces. #2 - use a heavy duty (Zooz15?) switch to turn a small (100-500) heater when the water temperature gets below 35 and off at 40. ( https://www.amazon.com/Finnex-Deluxe-Titanium-Heater-Guard/dp/B0199W72IW/ref=asc_df_B0199W72IW/?tag=hyprod-20&linkCode=df0&hvadid=198102114124&hvpos=1o2&hvnetw=g&hvrand=5203232755692963998&hvpone=&hvptwo=&hvqmt=&hvdev=c&hvdvcmdl=&hvlocint=&hvlocphy=9020341&hvtargid=pla-351398848268&psc=1) Ensure the tube is at the VERY BOTTOM of the sump pit so that even after the pump runs the heater is covered in water, same with the temperature sensor. #3 - use cord enabled mains powered water sensors (two) at a level that is above what should happen if you sump pump was working properly- since you have a situation where you experience freezing temperatures regularly you probably want them out of the water as much as possible to avoid water freezing on the contacts. #3 - Your frequency rule is a valid request, I'm not personally sure how you'd do that but an Application dedicated to monitoring it (check out Abicus (SP) from another developer that can count things like on/off cycles..) might be an option. General question, if the sump pit is experiencing freezing temperatures, is your output freezing? You might consider heat tape on a controlled outlet as well. 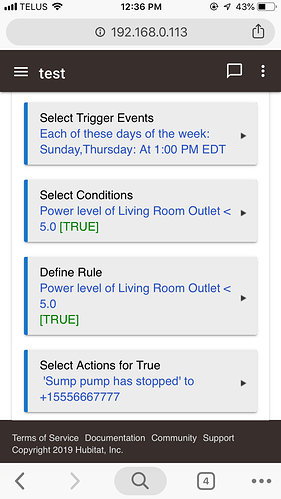 A dedicated sump pump monitoring suite (specify plug, specify water sensors etc) makes sense form a HSM stand point IMHO (as someone who has a sump-pump reliant home). I am following this subject and look forward to helping with other options you explore.